Giving your time and talents is a great way of helping to build the Kingdom of God and growing in your own faith and love for God. 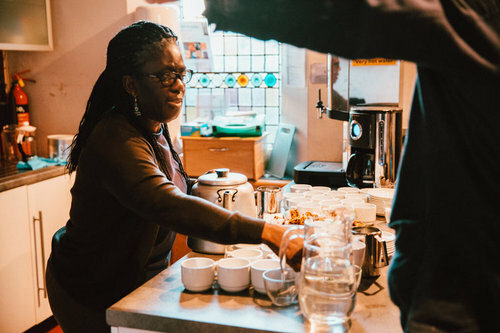 We believe that everyone has gifts and talents to be used to build the Body of Christ and whether those skills are social, practical or spiritual we believe that they are an important part of belonging to God's family here. Tollington Kids is all about connecting with Jesus in a safe, fun and friendly environment. We're passionate about working with parents to raise up a generation of young people who love God and his church. There are opportunities to serve on the Kids Team midweek and on Sunday mornings. Our fantastic Kids Team works with parents to help deepen our children's relationship with Jesus. We'd love to hear from you if you share that vision. Tollington Youth offers a dynamic and engaging youth programme, with a vision to see young people come into stronger relationships with God and each other. The Youth Team seek to disciple our young people and reach out to the youth in the local area. This team is passionate about seeing young people raised up to reach their potential in Jesus, and to be his witnesses. We work on Sundays and midweek evenings and also have a mentoring programme where we offer training for volunteers who would be interesting in mentoring a young person by meeting up with them for an hour a week. It is a real opportunity to encourage young people in their life and discpleship. The bible is clear. We are made to worship our creator. As we come to church week by week our rightful response is to thank God for who He is and all He has done in our lives. Our heart is to worship the Father in Spirit and in truth just as Jesus said and to present our whole selves to him as a living sacrifice. Worship is not just about singing songs on a Sunday but the whole of our lives, however when we do meet it's such blessing to have the Worship Team use their gifts and skills to led our congregations in worship.